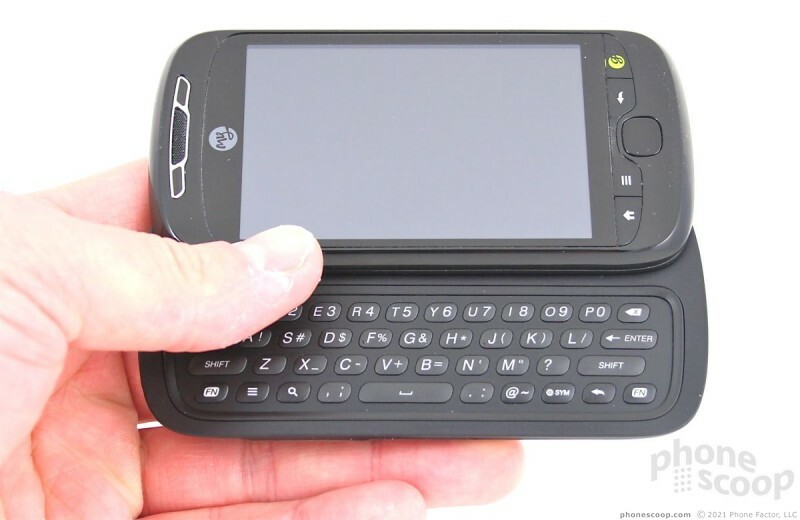 T-Mobile's myTouch 3G gains a slide-out QWERTY keyboard, a larger display, and better software. What's not to like? Well, a few things, as it turns out. 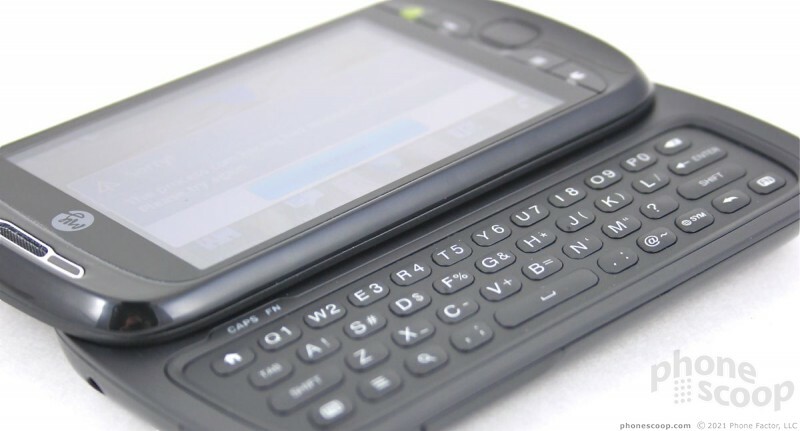 If you liked the original T-Mobile myTouch 3G, but wanted a physical keyboard, the new T-Mobile myTouch 3G Slide is what you've been waiting for. This sideways slider offers Android 2.1 and a full QWERTY keyboard for typing. Let's not forget some of that good HTC customization, as it has taken Android 2.1 in a slightly new direction to give it some personality. There are a few detractions, however. If you place the original T-Mobile myTouch 3G next to the T-Mobile myTouch 3G Slide, the family resemblance is obvious. They were cut from the same HTC-made cloth, no doubt. The overall shape and flow of the lines on the Slide are nearly identical to the original. The most notable difference is the size. The Slide is bigger in every dimension. 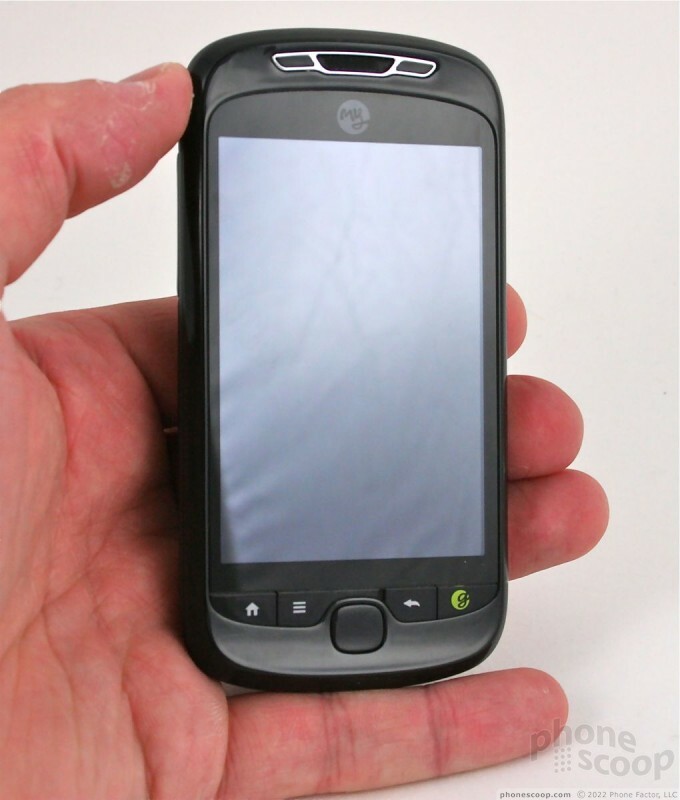 Where the original myTouch was slim, light, and pocketable, the Slide is thick, heavy, and not-as-pocketable. It still feels good in the hand, though, as the smooth plastics and rounded edges do away with any edges that might cause discomfort. Did I mention that it's heavy? The display eats up most of the Slide's front face. 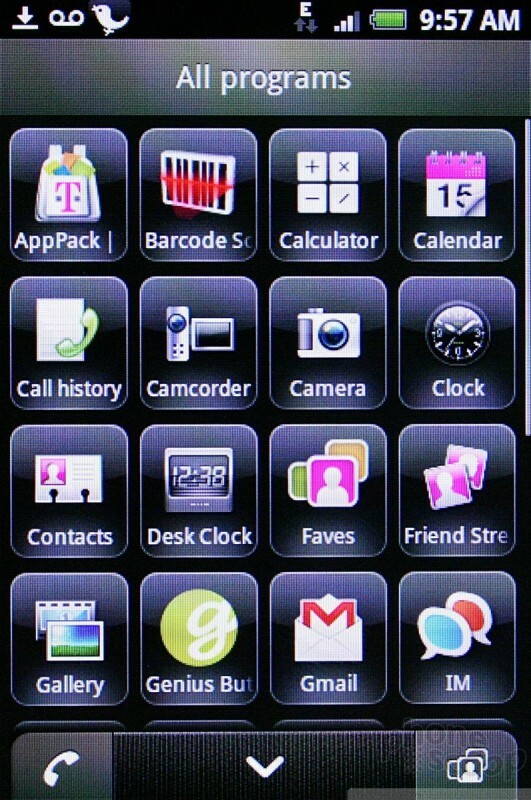 Below it are the typical Android control buttons, placed in exactly the same order as on the original myTouch 3G: Home, Menu, Back, Search. These buttons are flush with the surface of the Slide, wedged between the bottom of the display and the curved chin of the phone. I didn't care for this placement. They felt tucked too tightly, and travel and feedback was not satisfactory. It is difficult enough to tell them apart that accidentally pressing Back when you mean Search - or Menu when you mean Home - is a real possibility. The track ball has been replaced with an optical trackpad. The track pad is positioned between the Menu and Back buttons. I found that moving my thumb quickly between those two buttons often accidentally activated the trackpad, cause the screen or cursor to jump. This is annoying. I mostly skipped the track pad in favor of using the touch screen. The Slide's slider mechanism works fine, but I didn't care for the feel of it. 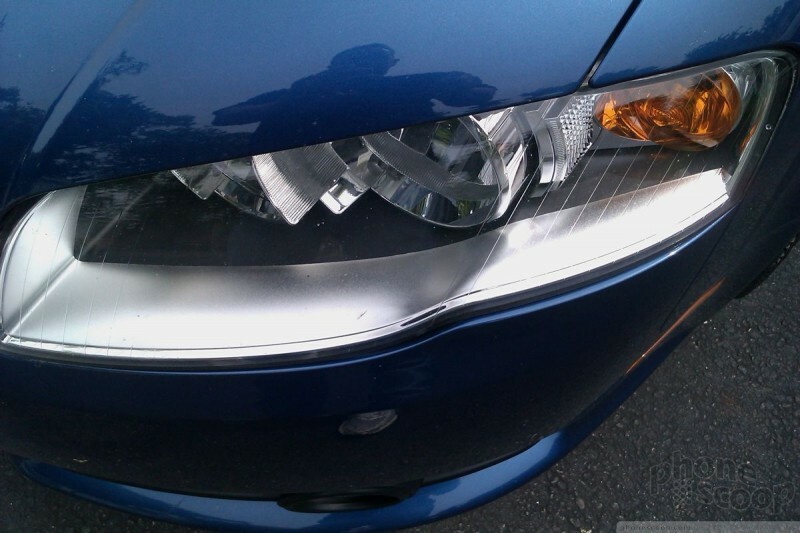 It has a cheap, plasticky texture that felt under-engineered. There is slight spring assistance, so it opens with no trouble, but it wasn't smooth. There was some grating of plastic on plastic. The full QWERTY keyboard has four rows, but that doesn't mean numbers get a row all to themselves. The top row doubles as numbers and letters. On most keyboards I've encountered, the secondary characters printed on the keyboard are set off (whether via color, or smaller print) so that it is easy to tell which the primary and secondary characters are. Not so on the Slide. That means you get keys that look like this: Q1, W2, E3, etc. It's not really a problem until you get to the right side of the keyboard, where you'll find: O9 and P0. See the difference? Yeah, in a hurry, neither did I. That means a lot of typos. Frustrating. Aside from that, the keys have a decent (though not great) shape to them and acceptable travel and feedback. The bottom row has separate comma and period keys, which is always helpful, and dedicated keys to launch search and reach odd symbols/characters. The volume toggle is tucked on the left side of the phone. 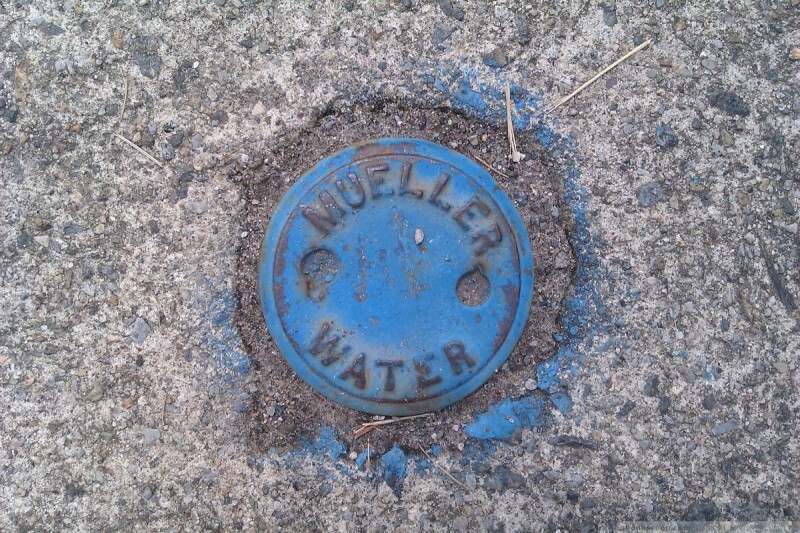 It is nearly flush with the surface, making it a wee bit difficult to find in a hurry. Once you find it, travel and feedback are good. There is a camera button on the right side of the phone. It is a two-stage key, and each stage had a distinct feel. The microUSB port is on the bottom, the 3.5mm headset jack is on top. The power/lock key is also on top. Given how vital a key it is, I thought it was a little too hard to find, and travel and feedback were a bit on the weak side. The microSD card port is buried under the battery cover, but thankfully you can replace the card without removing the battery. The Slide's display is 0.2 inches bigger than the myTouch's 3.2-inch display. This may not sound like a lot, but it makes a world of difference. Where the myTouch felt cramped, the Slide feels roomier and spacious. Too bad HTC didn't bother to do much with the pixel count. It's not that images, icons and graphics aren't sharp. They are clear enough, but they fail to pop like icons and graphics do on the superior displays found on the Incredible or Droid. There was also an overwhelming sense of dullness. It's certainly not a bad display, it's simply mediocre. Indoor viewing was fine, no problem. Outdoor viewing was impossible. 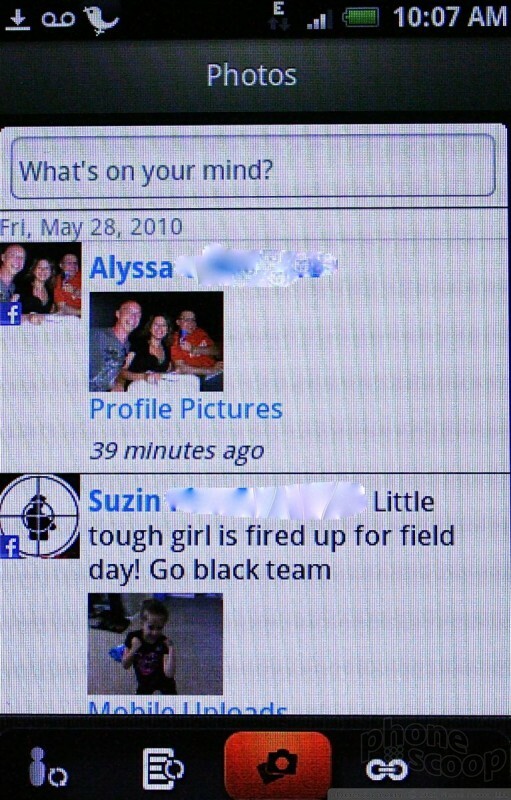 The white text on black background of Android's menus don't help. In order to use it outdoors, I had to shield the display with my hand. Some times that's just an impractical thing to have to do. Tested side-by-side with the original myTouch 3G, the Slide always performed worse. It consistently held one bar less than the myTouch 3G did, even in areas that I would rate "fully saturated" by T-Mobile's 3G signal. During the time that I tested it, the Slide never dropped down to T-Mobile's EDGE network. It always held onto 3G, even with no bars. How does this translate to real-world performance? Well, I didn't miss any calls when using the Slide. I did notice inconsistent data performance, though. Sometimes it would be blazing fast, and other times it would completely stall out. Phone calls were very clear with the Slide. In my tests, I experienced no static, noise or other weirdness. I could hear callers perfectly, and they reported no problems with my sound, either. Amtrak's automated assistant was able to interpret my speech just fine even when I had Soulfly's newest album blasting in the background. The earpiece volume might be a problem for some. 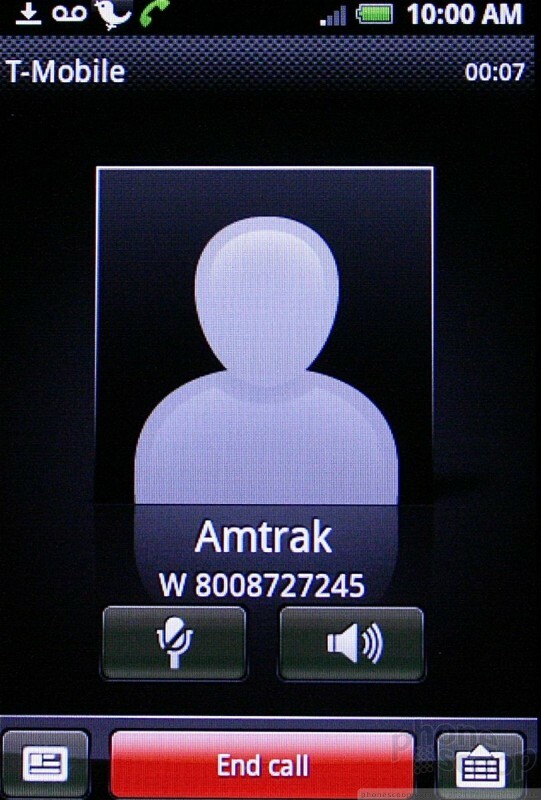 Set all the way up, I was just barely able to hear Amtrak over the same heavy metal background noise. Testing the volume in a car yielded the same result. Background noise can easily overpower the Slide's earpiece. Ringtones could also be a smidgen louder. The speakerphone performed perfectly in my home office. I was able to walk around, and even exit the room and still conduct a conference call. The battery life story is becoming a familiar one with Android handsets. You'll make it through one day just fine. Two days? Not so much. If you use social networks even modestly, expect the battery to be drained by the time the clock strikes 12 (Midnight, not Noon). I was able to fully discharge the battery in four hours of straight web usage, with Twitter, email, and music playback thrown in, but that's an extreme case. Charging it nightly will suffice for most. 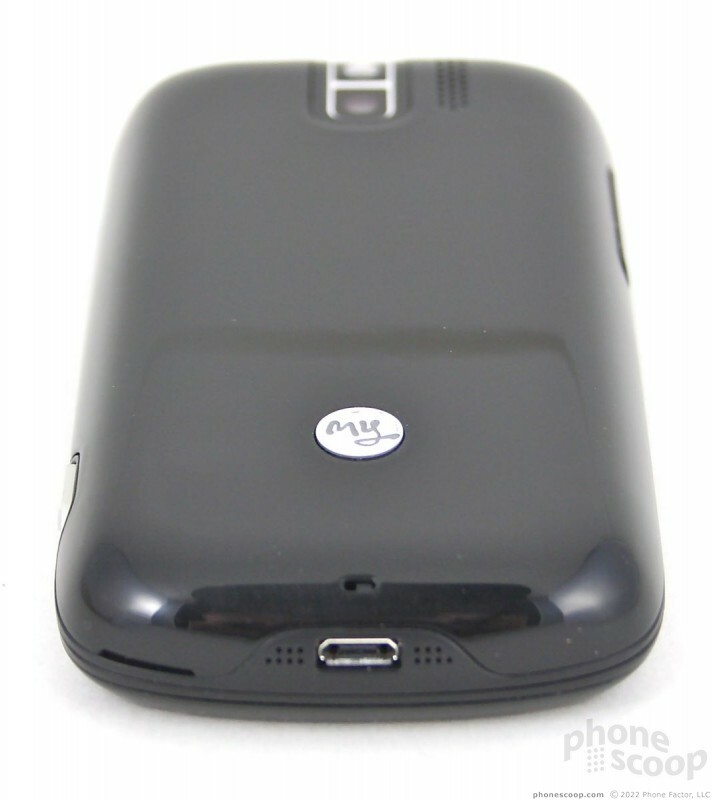 The myTouch 3G Slide uses a capacitive touch display. I had no problems with it at all. It registered 99.99% of all my touches, and was always accurate. I never had to adjust it or make any changes. 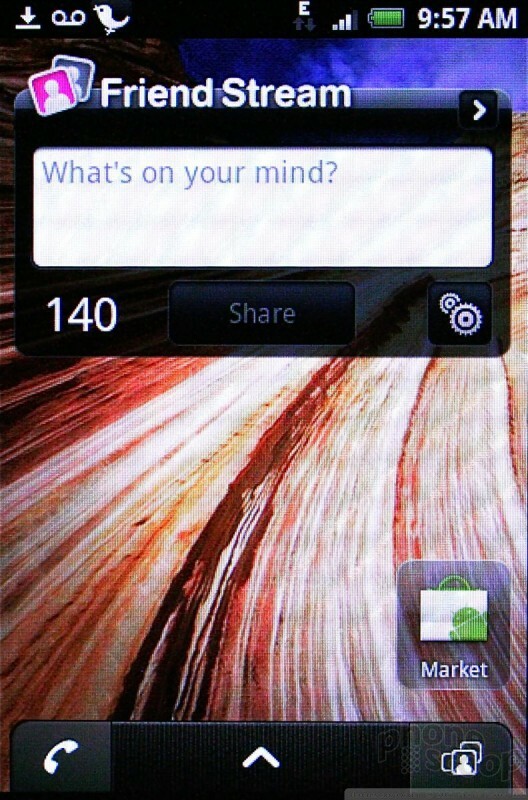 The myTouch 3G Slide doesn't use HTC's Sense UI, but it doesn't really use stock Android, either. HTC and T-Mobile have made some subtle changes that make the Slide at least different from other Android handsets, if not more usable. 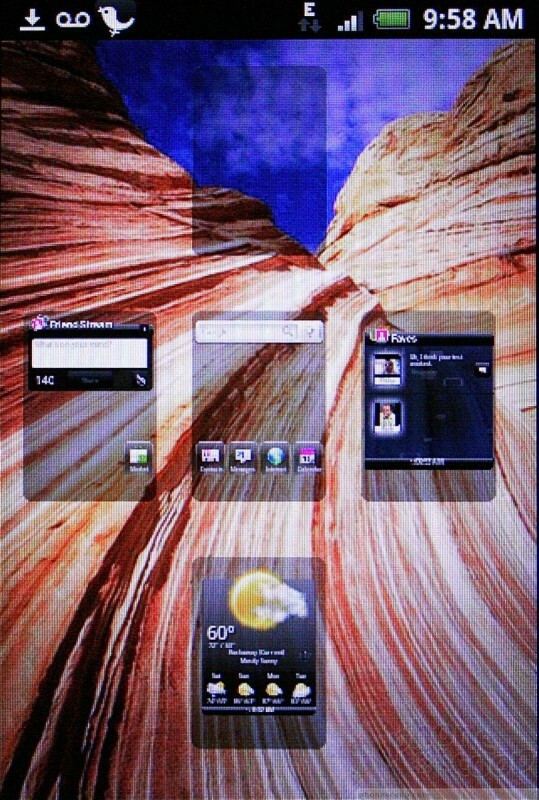 The Slide has five customizable home screens. The central home screen lacks the search bar along top as is customary for HTC Android handsets. 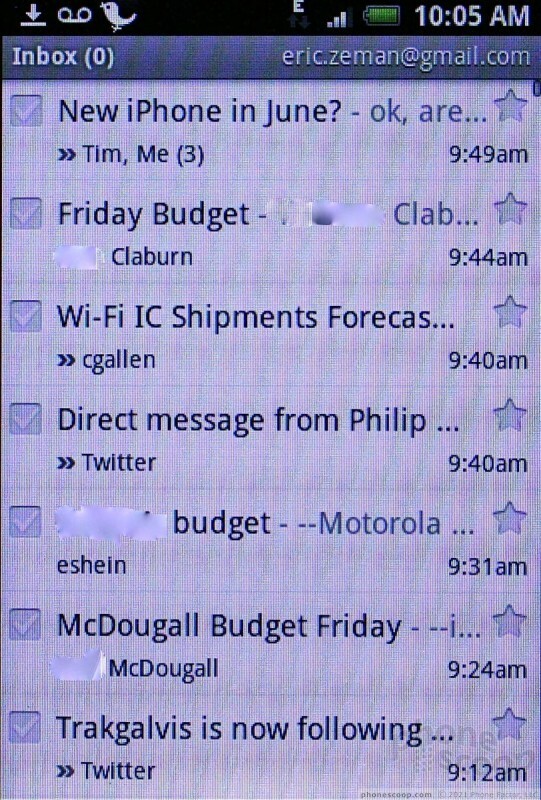 What you get instead are four software apps loaded on the home screen for contacts, messages, browser and calendar. Unlike the "free-floating" Android icons we're using to seeing, these (and all the icons in the Android main menu) are framed in an opaque square. It doesn't make them any easier to use. They simply look different. 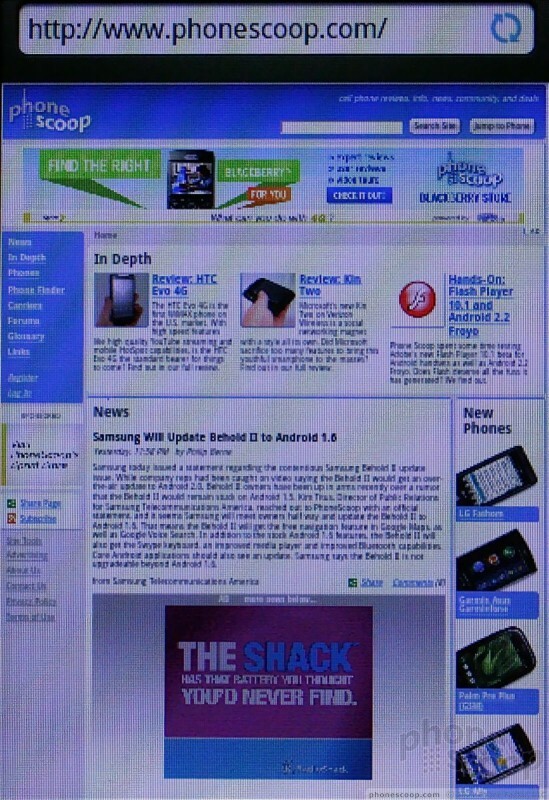 The main menu tab at at the bottom of the screen is flanked by two permanent icons. The one on the left launches the phone, and the one on the right launches the Faves contact list. 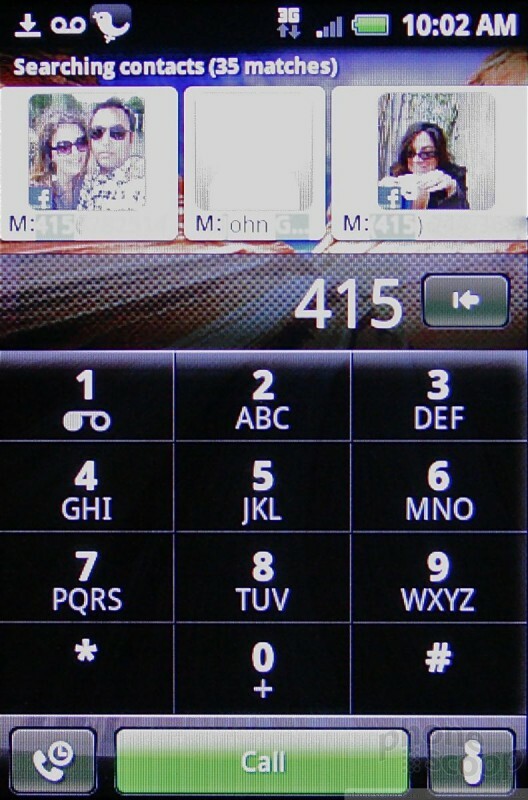 These buttons persist across all five home screens, making it easy to get to the phone in a hurry. Another thing that is slightly different is the notification shade. When you drag it down, it displays notifications as normal, but it also includes the four most recently used apps. This means if you've used apps W, X, Y, and Z, it will show the icons for those apps when you pull the shade down. Last, another change I noticed is that the unlock screen contains more notifications, such as missed calls, SMS messages, and emails. Other than that, not much has changed about the way Android's menus behave. 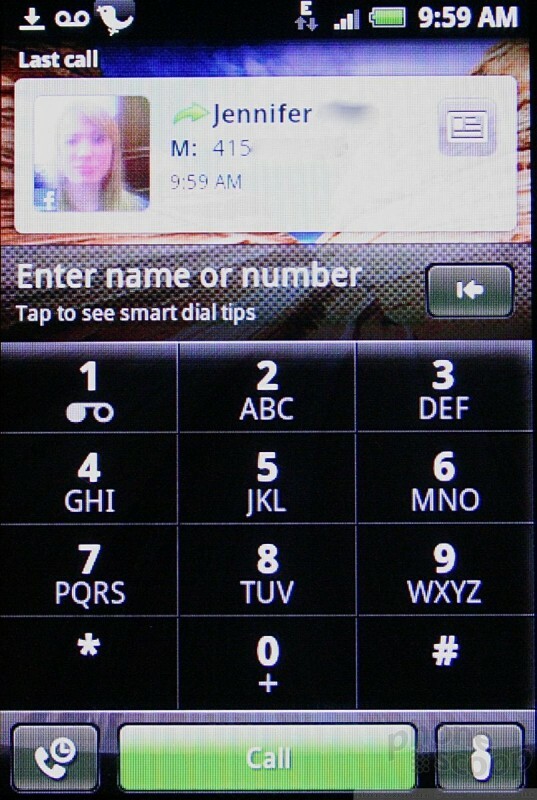 The constant presence of the software phone button helps alleviate the pain of not having a real phone key, somewhat. Press it, and it takes you to the dialpad. The most recently placed/missed call is placed above the dial pad. Press it to re-dial, or dial a new number directly if you want to talk to somebody else. 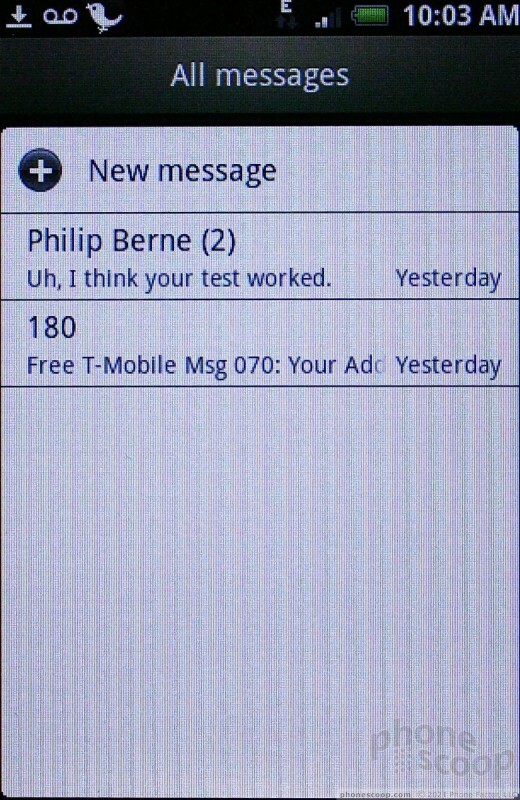 As you type, the phone sorts through your phone book in one of the coolest ways I've seen. Say you dial an area code. All the matches in that area code are immediately pulled up into a cover-flow-esque graphic. You can then swipe left or right through those contacts to find the right contact/number. It will also tell you how many matches you have for the digits dialed, and preview Facebook profile photos if you've synced a Facebook account. Touch the face of the person you want to call, and the Slide connects you. Neat! 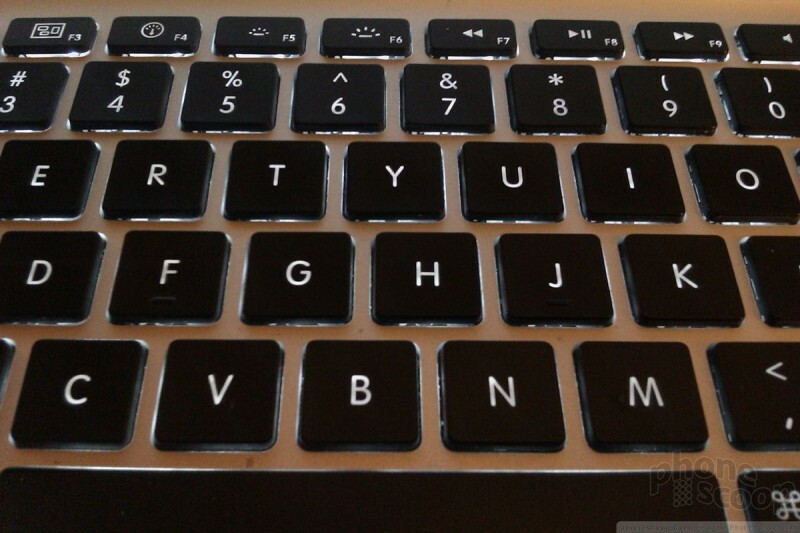 If you use the physical keyboard, it will sort through names rather than numbers. 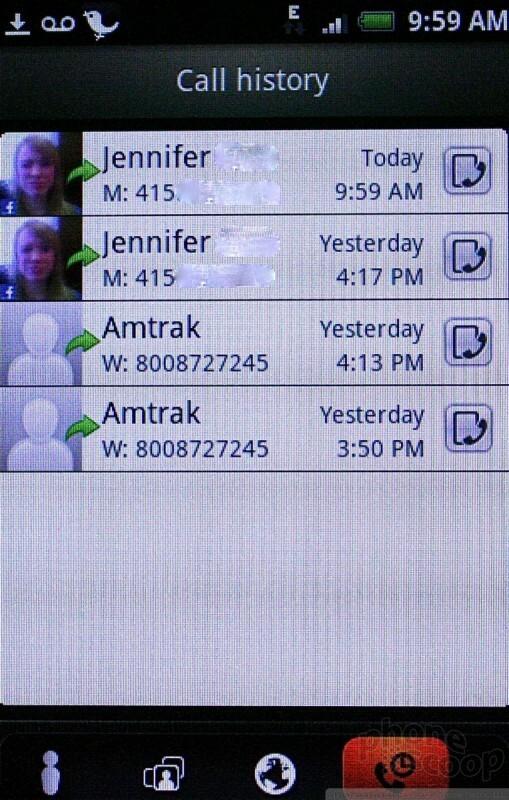 The usual call history, calling groups, faves and online directories are all supported. Android 2.1 is very adept at handling contact databases. It seamlessly merges Google and Facebook contacts, and automatically cross-populates data when it is incomplete in one of those databases. That means if you have somebody's email address in Gmail, but their phone number only in Facebook, you'll see both in a single contact page for that person. The usefulness of this feature cannot be understated. It will also pull down Exchange contacts if you have them. All of this happens automagically from the internet in the background. God I love modern technology. HTC has added its own touches to make things better/different. The Slide comes with a version of its "Faves" contact program, which is borrowed from Sense UI. Users can populate the program with their most-often contacted friends, family, colleagues, etc. The graphics are fun, and the UI does this neat little flippy card thing when you interact with it, but it's also useful. When a Fave is displayed on the page, there are icons that appear under the Fave's picture that let users easily call, compose an SMS, send an email, or interact with them on Facebook. Here's where the Slide differs less from other Android handsets. It has the same Gmail application, and HTC also offers an Exchange-compatible email program for business users. I wasn't able to detect any changes or improvements in these apps when compared to other Android 2.1 devices. 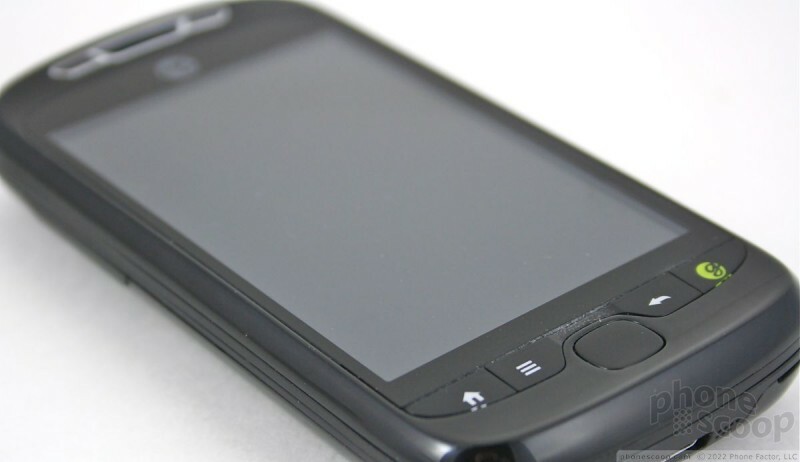 The myTouch 3G Slide supports GTalk out of the box and, surprisingly, also includes AIM, Windows Live Messenger and Yahoo Messenger. These three are lumped together into the same IM client, but GTalk gets its own. They all work well enough. 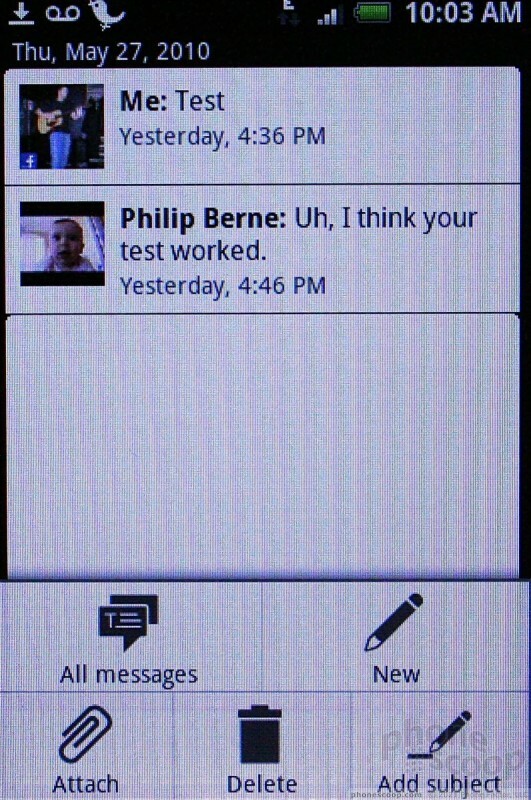 The messaging app works just fine. It threads conversations together, so you can follow the train of thought with your friends, and even see pictures embedded in the conversation. The Slide comes with Swype, which seems redundant on a device with a physical QWERTY keyboard, but it works pretty well. I find Swype to be more accurate with longer words and stick to pecking out shorter words as normal. HTC and T-Mobile have made a few odd choices on the Slide. The Slide comes with HTC's Friend Stream software. Friend Stream channels all your Twitter and Facebook account status updates into one place. It's OK, though I find that it doesn't refresh as often or consistently as I'd like. It will also link to Flickr. 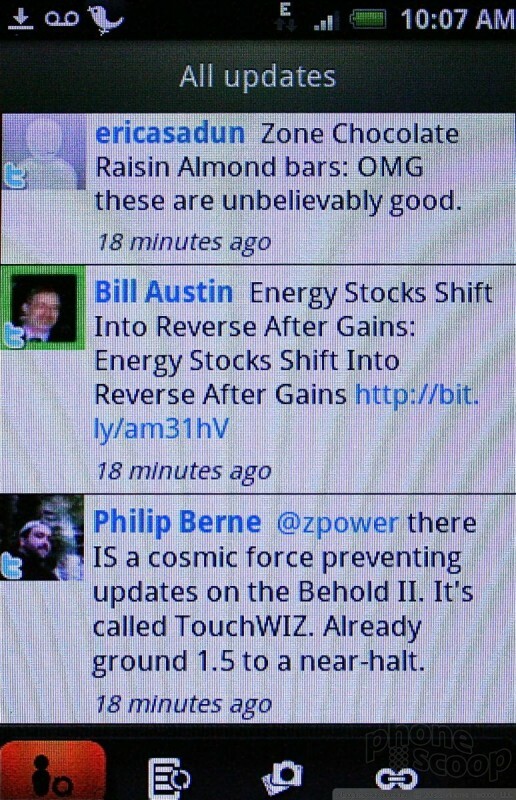 The Slide also comes with HTC's Peep Twitter client, which is a separate program from Friend Stream. Peep works better than some of the third-party apps out there, but I find the new, official Twitter application is growing on me of late. When it comes to Twitter on Android, you have plenty of free options in the Android Market. What's really weird is Facebook. Friend Stream interacts with Facebook, but there is no Facebook application actually installed (or at lest discoverable) on the device. I can't understand why Facebook itself would be absent (at least from the app menu). In order to interact fully with Facebook, I had to download the app from the Android Market. That's just goofy. 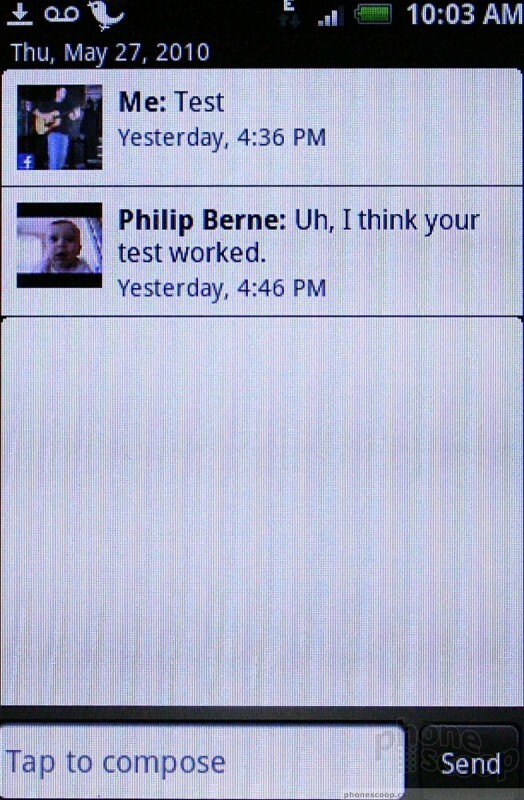 Android supports pretty much any and all social networks. The Android Market is chock full of apps that interface with them. The music player has garnered a little bit of attention from HTC. 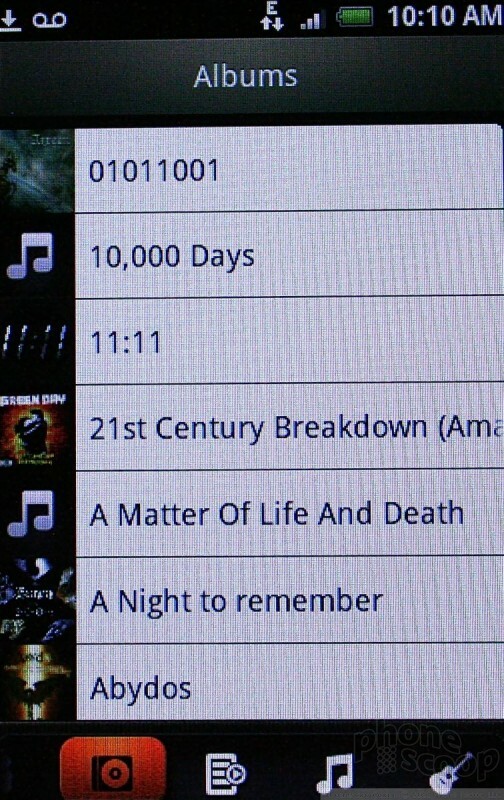 The basic library and song/playlist discovery process are mostly the same, but HTC has re-skinned the player itself. When music is playing, rather than a static picture of the album cover with playback controls under it, you can swipe through the songs in the current playlist. It's not much, but it's something. The menu items allow you to share the song, add it to playlists, look at song file info, but falls short of offering much-asked-for features such as an equalizer of any sort. 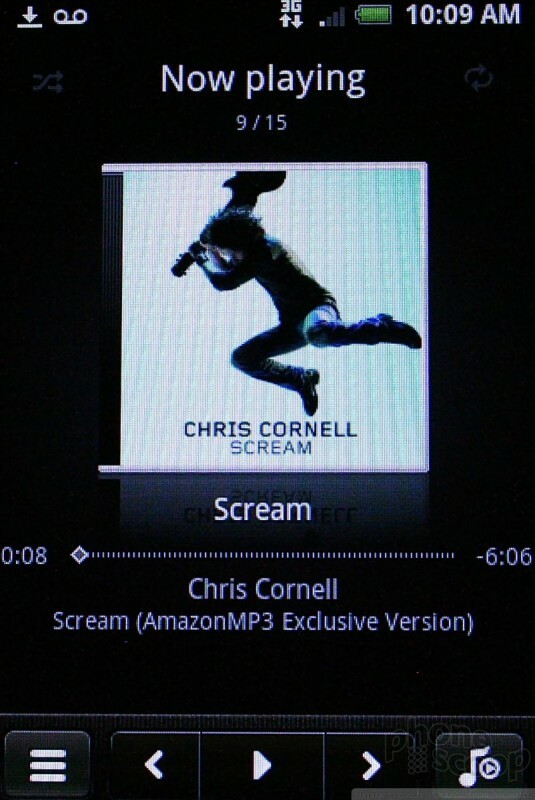 There is no FM or XM radio, but the Slide comes with the Amazon MP3 store pre-loaded. It is a breeze to use Amazon to search for and download music if you already have an account. One thing worth noting, the way the lock screen works when music is playing is really cool. When you press the lock key once, you see the album cover and you have access to the play/pause rewind/fast-forward buttons without unlocking the phone first. Music controls are usable with the phone still locked. This means you can shut off the music player quickly when it needs to be silenced. That's a nice feature. Music playback through the speaker actually sounded pretty good. It sounded better through stereo headphones. Music playback through stereo Bluetooth headphones was pretty good, too. 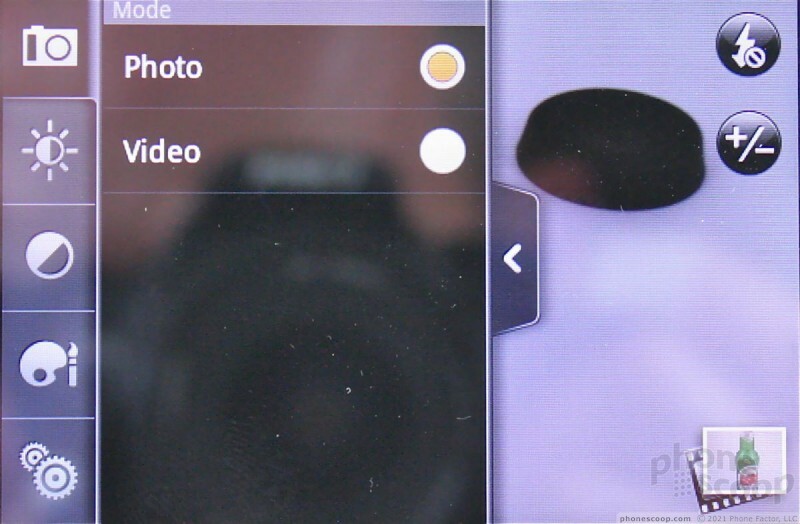 As far as I can tell, the Slide is using the stock version of the Android 2.1 camera. 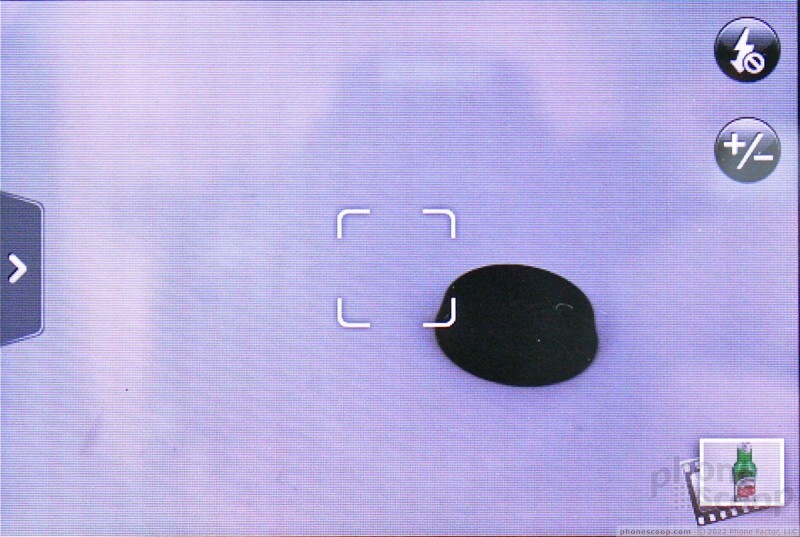 Pressing the dedicated button for about one second will launch the camera, which then takes another 1.5 seconds or so to fully open. Not the fastest camera draw in the west, but I'll take it. 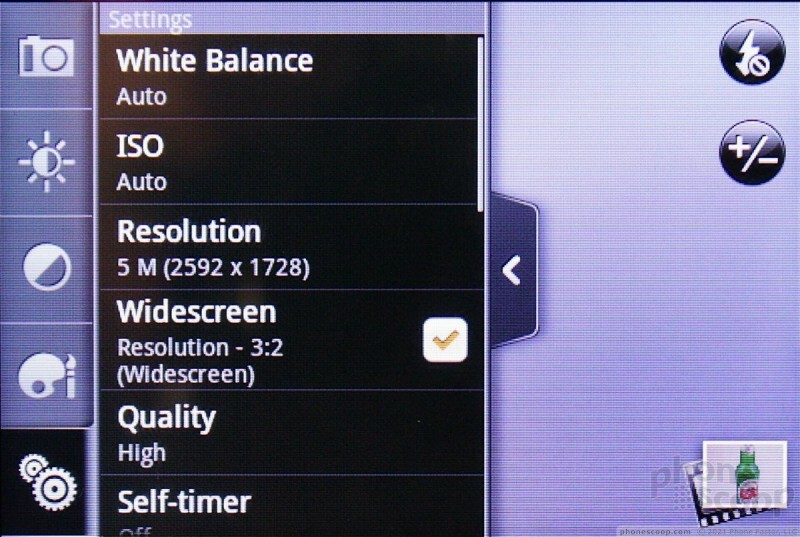 There are controls on the screen that let you control the flash and exposure levels without opening the menus. This is nice. Fast access to the flash is a must-have feature for me. There's a tab on the left side of the screen. Press it to get at many of the camera's other controls. The controls let you adjust the shooting mode, exposure, saturation, sharpness, add effects, as well as dial down and alter the core settings. ISO (the camera's "speed") ranges from an incredible 100 to 1250. If you see something on the display and you want it to be in focus, tap it. The camera will focus on that spot (perhaps your friend's radiant smile). Press the optical mouse key to actually take a picture. 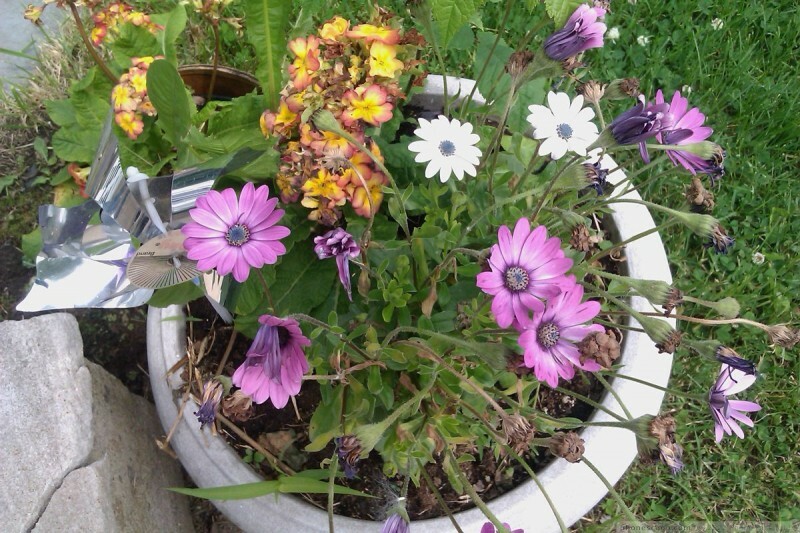 Alternately, you can use the two-stage camera key to focus and take pictures. Either way, I found the Slide is slow to focus, and slow to take pictures. The Slide completely failed at capturing the shots I wanted during a t-ball game due to its lack of haste. It isn't for getting that great shot during any sporting event. Want to take pix of all your friends holding their fruity drinks? Go for it. The review screen lets you send the photo off wherever you want to send it with just a few quick taps. The Slide uses the same photo gallery software as seen on the Droid Incredible. 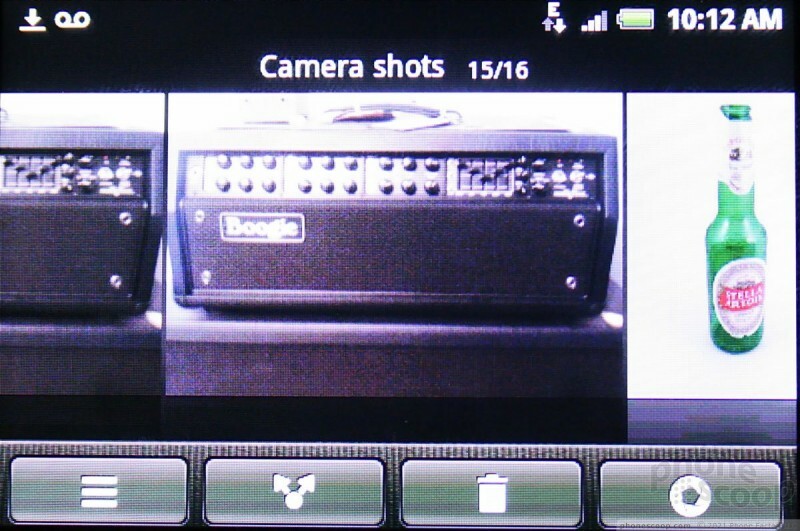 It can be opened from either the camera or the menu, and presents pictures in either a timeline or via grid. The timeline mixes pictures and videos into one long stream of images and movies. The first picture you shot is on the far left, the most recent on the far right. The entire stream flows back and forth as you swipe your finger to and fro in a very fluid manner. It's cool; I like it. If you want to fly from one end of the spectrum to the other, it's best to resort to the grid view, which lets you see more than one or two images at a time. There are always some software buttons along the bottom of the screen that let you access menu options, share photos, delete them or get back to the camera. As with the Incredible, there are but two editing functions. Pictures can be cropped and rotated. That's it. Users can't make any other adjustments or edits. Ah well. The Slide has a 5 megapixel camera. That's enough pixels for most people and most needs. Despite the slow time-to-focus, the results are often worth the wait. I found images captured to be clean, clear and well focused. Color came through accurately, and — when the flash doesn't go off — indoor shots actually look passable. 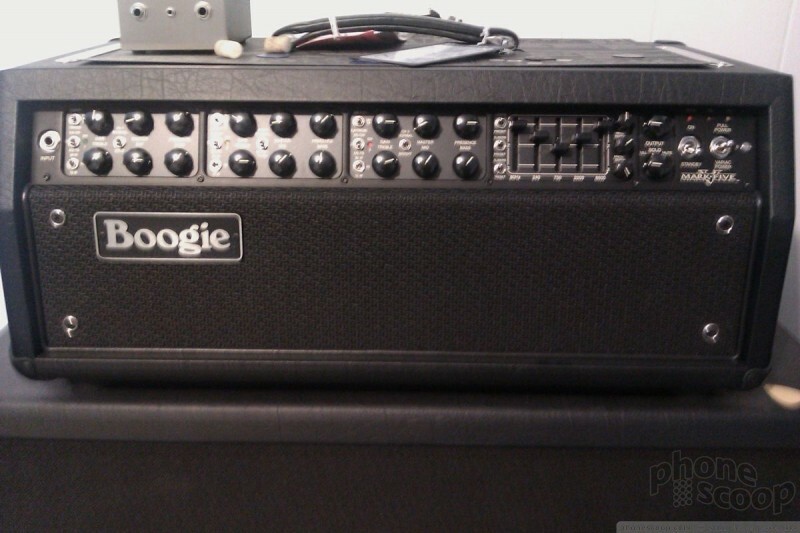 Sure, there's a bit of extra grain and noise, but its an acceptable level. The camera does much better outdoors. Colors look rich and lush. 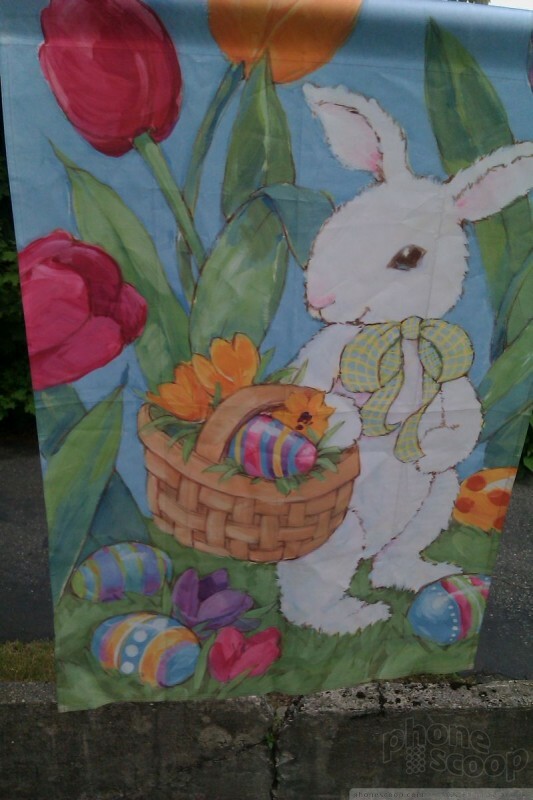 Overall, I was pleased with image quality. You have to pay attention to the flash settings, but chances are you're going to come away with a usable shot. Video was pretty good, too. It displayed more noise and grain, but focus was solid and there was no odd motion or ghosting as you panned the Slide around. You'll definitely be able to capture some YouTube-worthy clips. Spielberg wannabes will still need a dedicated video camera, but Indie directors just might be able to put together a decent short with the Slide. The browsing experience on the Slide is the same as on any other Android phone. The browser software does not appear to have been updated, and other than the substitution of T-Mobile's home page, you might not be able to tell it apart from other Android handsets. In 3G areas, browsing speeds were inconsistent. At times, it was lightning quick, and at other times, molasses slow. When using Wi-Fi, it was consistently quick. 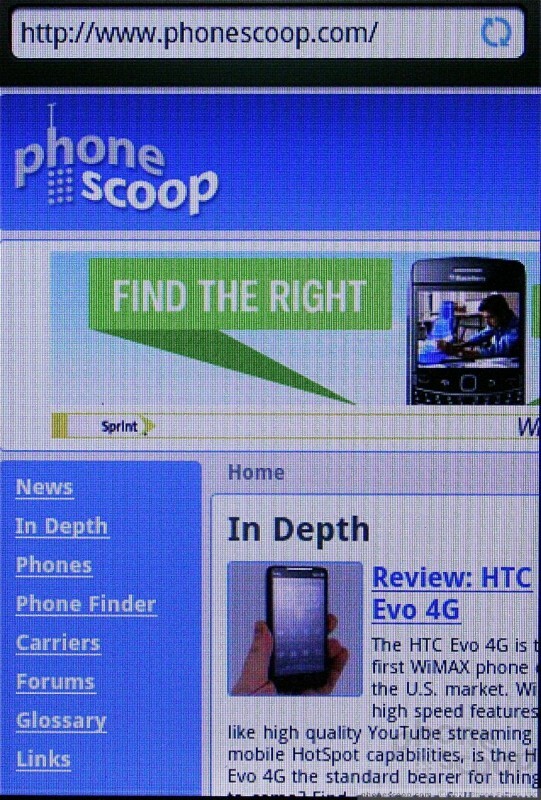 The Slide is an HTC Android phone. That means you can change nearly everything. In fact, T-Mobile and HTC have made a pretty big deal about the myTouch series devices being yours to customize as you please. For example, when you first boot the phone, it asks you a bunch of questions about how you plan to use the phone (mostly to check email, mostly to upload photos, etc.) and it then creates a user profile on the fly during set up. That's pretty cool. 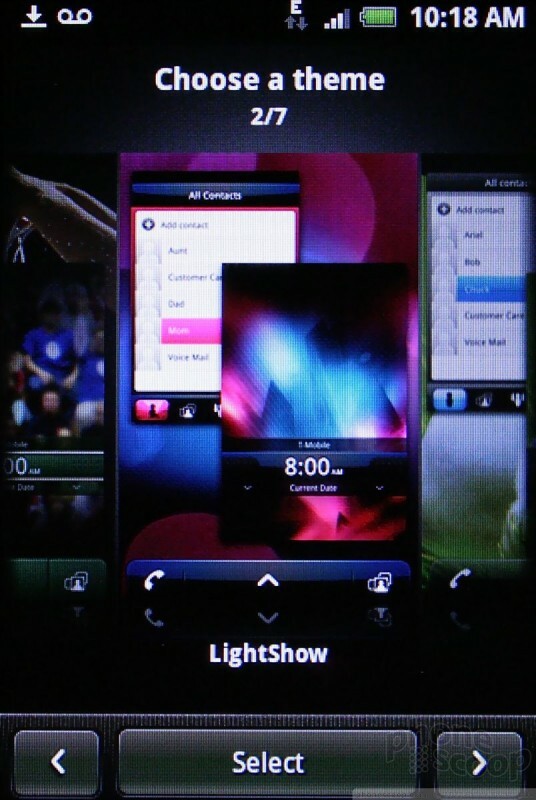 The Slide also offers a bunch of different themes and modes which would appear to come from HTC's Sense UI. They can be customized at will, and the different profiles prioritize different applications depending on how you'll be using the device. Obviously, with five home screens (expandable to 7 if you want! ), the possibilities to personalize the phone are unlimited. You know the drill here. The Android Market is up to 50,000 apps. You want apps, the Android Market is your path to nirvana. Given the sheer volume, there's very little that isn't available. The Slide also comes with T-Mobile's App Pack. This service recommends a bunch of different apps for a number of different categories, such as entertainment, fitness, music, news, etc. 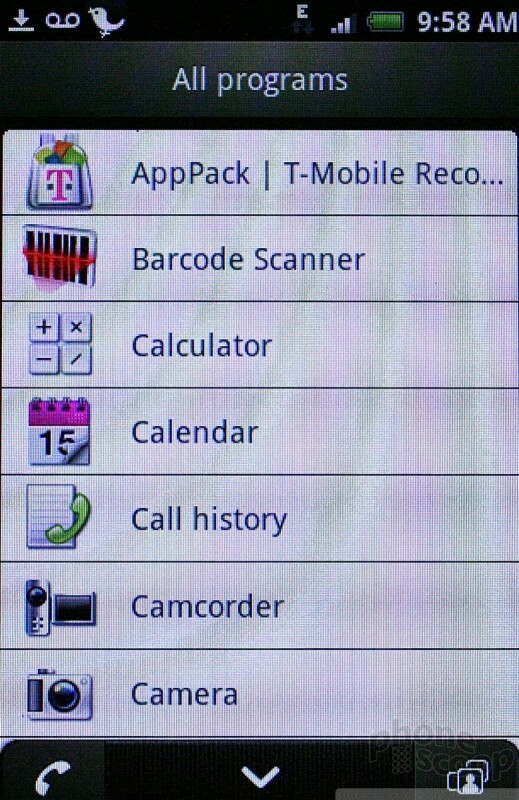 I couldn't discern any rhyme or reason as to why T-Mobile selected the apps in these categories that it did. Some were free, others cost money. Some were rated well, others poorly. The Slide supports both stereo and mono Bluetooth headsets. I had no trouble pairing with a number of different devices. Sound quality of phone calls through mono headsets was good, as was quality through stereo headphones and speakers. I was also able to pair the Slide with my computer and pass files back and forth with no problems. The Bluetooth file manager worked like a charm. 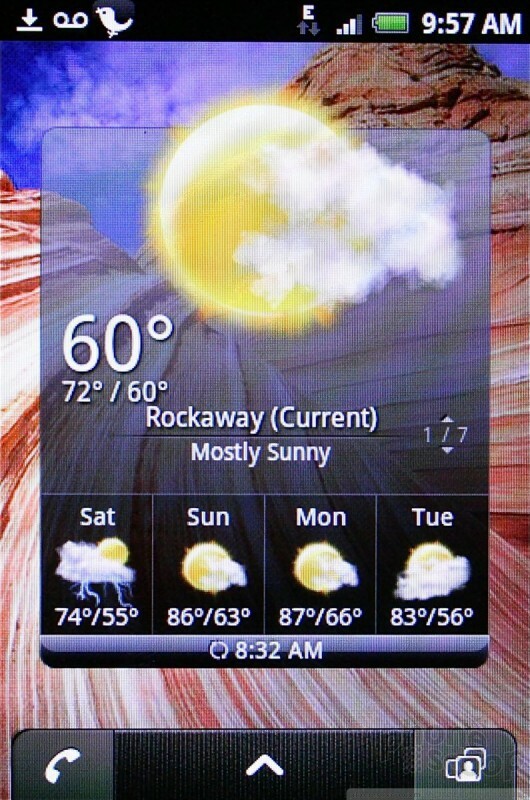 The clock and weather apps have been really downplayed on the Slide. They are there, and can be added/customized as you'd expect, but they aren't front and center out of the box. A number of different clock faces are available, and you can always check the time quickly with a quick press of the lock key. 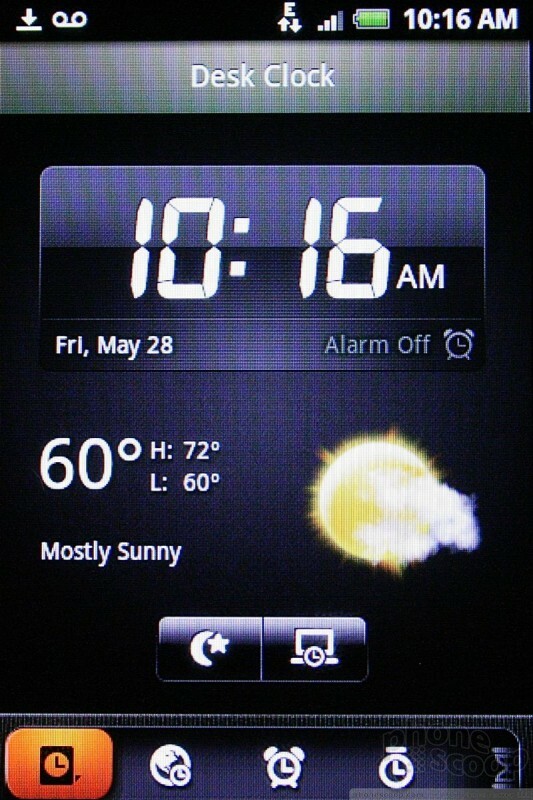 it also has the desk clock app, which can be used when the phone is sitting on a desk or charging at night. It lets you see the time, weather, and a few other bits of data. OK. Instead of offering Google Search as the native search function, the Slide has the "Genius Button." Press it, and rather than a simple search box, you get a voice-activated search tool. 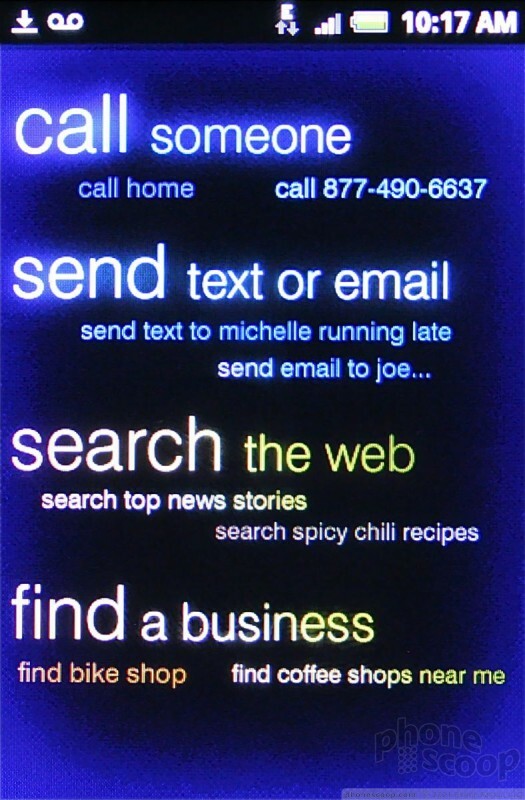 There are four main categories: Call Someone, Send Message, Search Web, and Find a Business. Basically, the app wants you to say the word "Call" then add a contact name. Or say "Send" and then choose a contact name. Or "Search" for something on the way, etc. Once you get the hang of it, I suppose it works OK. I found the voice recognition to be less than accurate, and it often looked for the wrong thing. That just wastes time and ticks me off. I much prefer a regular old Google Search box. Thankfully, you can choose to add the regular Google Search tool to the home page. The myTouch 3G Slide is an interesting beast. It adds a physical QWERTY keyboard for those seeking additional hardware, but comes at the cost of extra weight and size. The keyboard is unfortunately only so-so, which means you really need to weigh the trade-offs here. Since Swype is on board, composing messages with the software keyboard is really not that bad of an experience. 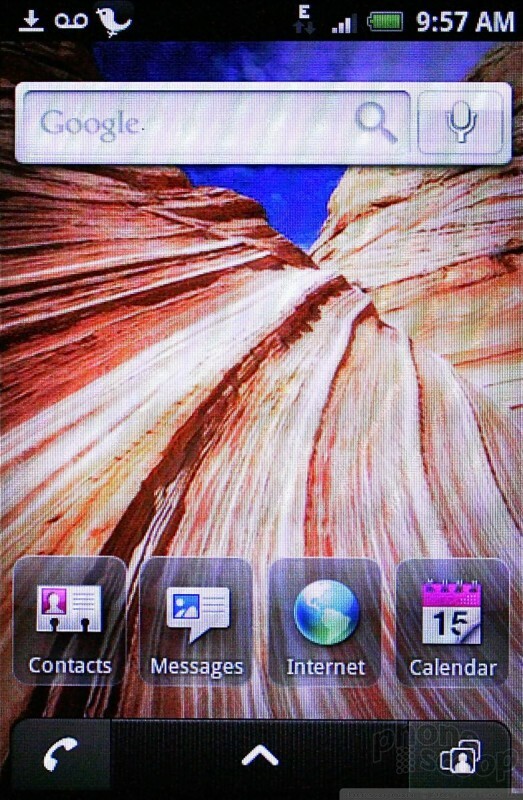 HTC and T-Mobile have made some changes to the basic software and menu arrangements, but nothing earth shattering. The biggest improvements come with the better notifications, quicker access to recently used apps , and the phone. 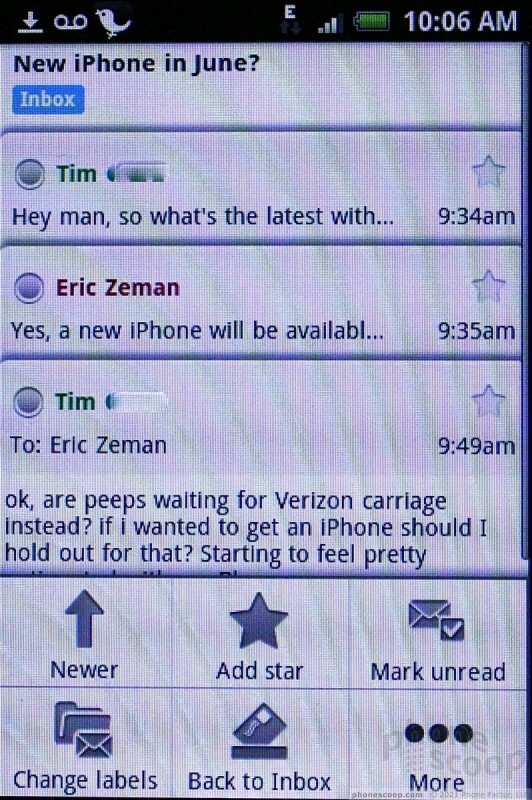 It's clear that HTC has convinced T-Mobile that the stock version of Android needs some sprucing up. The messaging and social networking apps are par for the Android course, as are the email and browser functions. There's nothing to really set the Slide apart in that respect. The camera is a touch on the slow side, but it performs well. The music player has been refreshed a little bit in terms of appearance, but doesn't add enough new functionality for me. 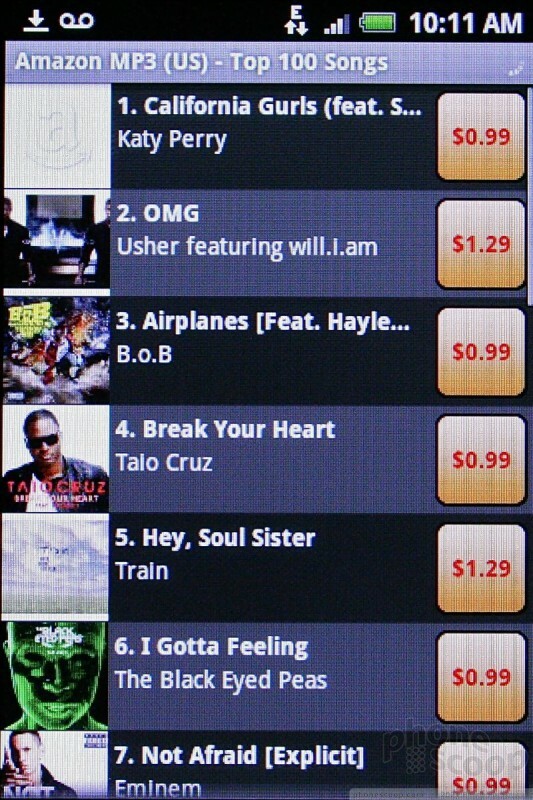 At least the Amazon MP3 Store is on board. In the end, I think the decision really comes down to form factor. Do you want the real keyboard and slightly bigger screen, or is something like the Nexus One more your style? It's a tough call. I'd recommend you go to a T-Mobile store and spend some time with the Slide before making a final decision. 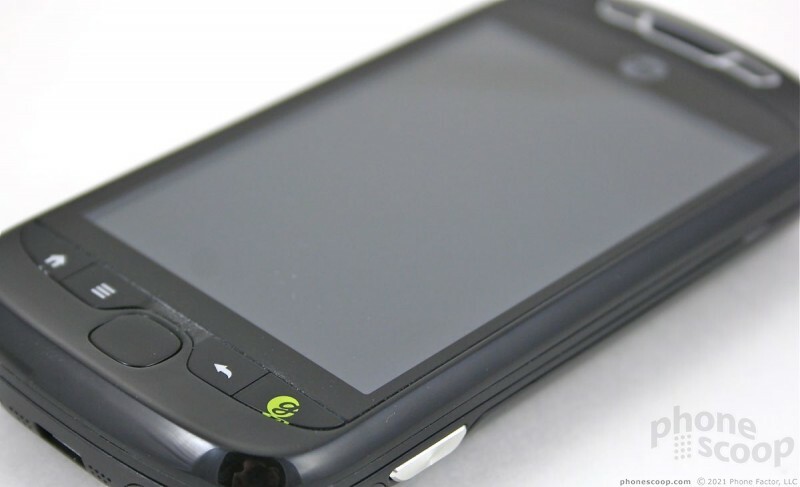 Today HTC and T-Mobile announced the myTouch 3G Slide, an Android 2.1-powered phone with both a touch screen and full slide-out QWERTY keyboard. This addition to the myTouch line features several new software programs that borrow heavily from HTC's Sense user interface concept. HTC and Sprint today announced the Bolt, the first smartphone to ship with support for three-channel carrier aggregation (3xCA) for Sprint's LTE Plus network. The HTC Bolt can aggregate three 20MHz LTE channels to improve wireless performance. 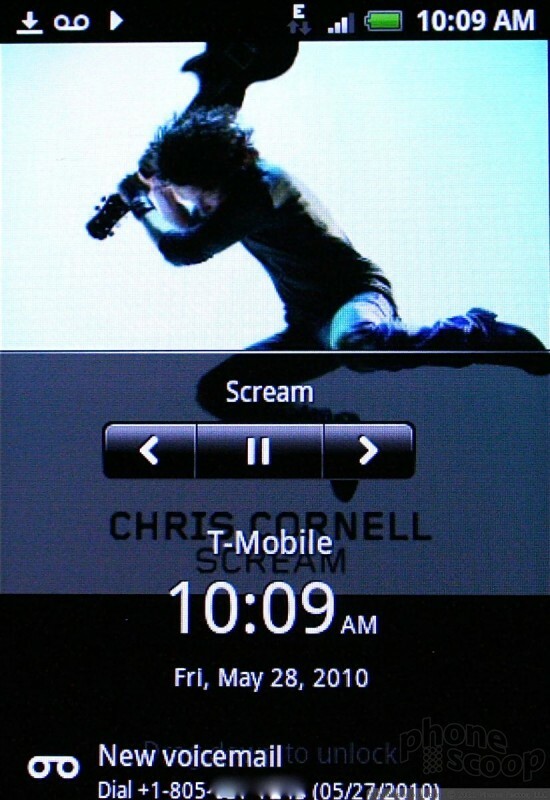 HTC and T-Mobile have released Android 2.2 Froyo for the T-Mobile myTouch 3G Slide. In addition to the standard new Froyo features, it also includes T-Mobile's Wi-Fi calling app and a number of bug fixes. HTC today announced the U11, a flagship smartphone that responds to squeezes along the side edge. According to HTC, the U11 will open the camera, dictate and send a text message, or even open email with a gentle squeeze. HTC today announced the U12+, its flagship handset for the year. The phone carries over the "liquid design" from last year's U11, but updates the color selection for the metal-and-glass chassis. I love the keyboard on my HTC touch pro 2 and it is way better than this, but I'll miss it when EVO is out. You should at least try it before you knock it. It works really well. Almost got all of the extras in there, Eric! Couple of things that I noticed, or didn't notice in your review was, "Dragon Dictation", HTC Adobe Flash player, and pinch-to-zoom. "Dragon Dictation" is a voice recognition software that a lot of doctors use in the medical field. What kind of specs does this phone have, Im at work so can not access some sites this is one of them I am allowed to be on. Wanted to see how fast it is and the quality of the screen. 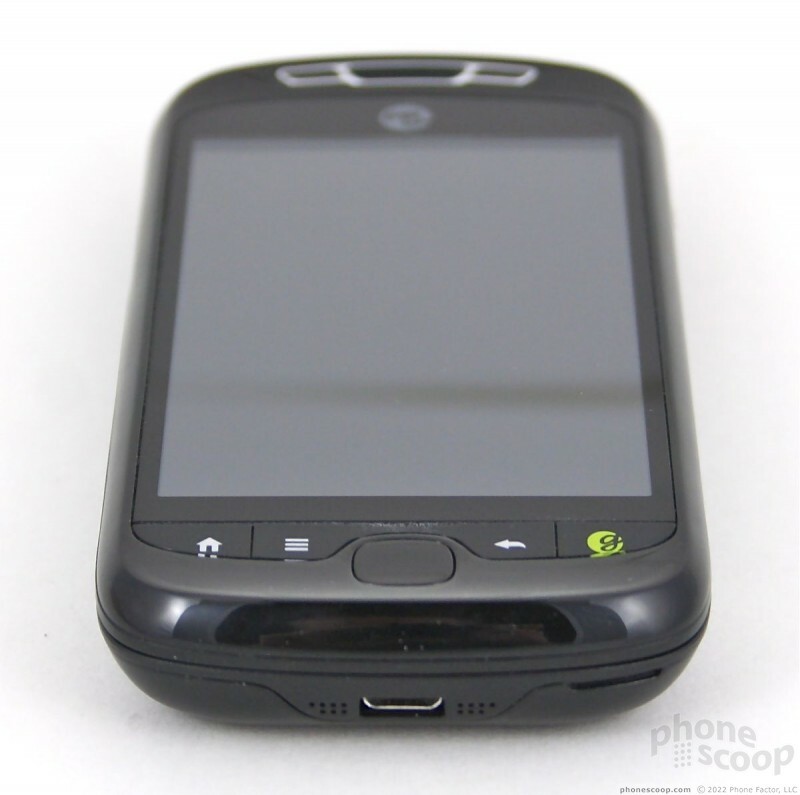 The phone has an ARM-11 600MHZ processor. Pretty fast. This is the fastest GSM Android phone I have had besides the Nexus One.